The painting is based on Irene Caesar's photo "Arthur Danto wise with puffy cheese doodles"
In consequence of luck and longevity, I have had three overlapping careers. The first career, that of an artist, was facilitated by the circumstance of serving as a soldier for nearly four years in World War II. The experience helped straighten out the muddle of my youth, but practically, I benefited from the GI Bill of Rights, under which I had four years of free tuition in whatever university that would have me. In Detroit, where I grew up, culture was embodied in two white marble buildings, the main library of Detroit, and, across Woodward Avenue, the Detroit Museum of Art. Wayne University was a constellation of buildings behind the library. But for as long as I can remember, I wandered the galleries of the various collections, and decided early on that I would be an artist, so really, the DIA, as it now is called, gave me my education. The art program at Wayne in those years was fairly bland, but the remarkable collection of German Expressionist art, and particularly the prints made by Schmitt-Rothloff, Kokoshka, Pechstein, Nolde and the others, were my texts. I began to carve the end-pieces of fruit boxes, and taught myself print-making. I did some painting but I had no gift for color. I did, however, show the woodcuts at a gallery on West Grand Boulevard. And I submitted my prints to national and international exhibitions, which landed them in important collections. I completed my education in two years, since I was given credit connected with my military service. I had learned French in Morocco, Italian in Italy, where I made the landings near Battipaglia before being taken in trucks to Naples. The Germans had moved out, but forced a battle in Monte Casino. I had two years remaining on the GI Bill, so I decided to move to New York and - this is characteristic of my life - I decided to use the time to study philosophy. As an artist, I had little difficulty finding galleries in New York, and Columbia accepted me on probation, since I had not been able to take the introductory course in philosophy at Wayne. I also applied to NYU (New York University), which turned me down unless I took sixteen hours of undergraduate work. Naturally I chose Columbia despite the probation, though I have to admit that I was pretty much at sea. As there was little likelihood of becoming a professor anyway, I learned what I could, meanwhile building my art career. I thought I would probably wind up an art teacher somewhere, though my work was bought and shown and reviewed. I studied with Suzanne Langer, the author of Philosophy in a New Key. Her mentor, Ernst Cassirer, who had come to Columbia as visiting professor, died abruptly in front of the Faculty as he turned to answer a student?s question, and the department appointed Suzanne to finish his courses. She was attractive and European, and entered the classroom with a cello. I wrote a paper on Kant?s Third Critique for her, which she liked a great deal. But the department was not especially supportive of her, since she was a woman. Male professors of no great distinction said that women were just not able to do philosophy. But in truth, I must admit, I could see very little connection between the philosophy of art as written by philosophers down the ages, and the great art that was displayed in the few galleries that promoted Abstract Expressionism - Betty Parsons, Sidney Janis, and Samuel Kootz - were the main sponsors. In April, 1949, there was an article in Life magazine on Jackson Pollock, whom it implied was the greatest living artist. That article was what drew me to New York. I decided to superimpose Pollock's style on the German expressionist style I had adopted. But I found that I had a gift for philosophy, and began to publish articles in Mind, The Journal of Philosophy, the Review of Metaphysics etc. I wrote a worthless dissertation. I wanted to do a piece of real philosophy, but I was not yet up to that. I certainly had no interest in writing on aesthetics, since it had so little to do with the art that engaged me. I got interested in the philosophy of history, and applied for a Fulbright Fellowship in the first year that they were offered, and won a year in Paris, where I naturally got interested in Existentialism. Paris was pretty much the same as it was entre les deux guerres. Naturally, I wore a beret. Meanwhile, the universities, which expanded to accommodate veterans, were hiring teachers, and I was able to find a job at the University of Colorado. I found two recently hired philosophers, Christopher Jackson, who was a student of Gilbert Ryle, and John Nelson, who was a student of Norman Malcolm, a student of Wittgenstein. I learned analytical philosophy from them, which I knew nothing about from the classes at Columbia. That really was my philosophical education, since Malcolm sent us mimeographed copies of the Blue Book, the Brown Book, and the Mathematical Notes by Wittgenstein, and we studied these together. Unfortunately, the job lasted only a year. The veterans had run out, which coincided with a generation of students born at the height of the Depression. Back in New York, I completed my dissertation, and had a piece of exceptional luck. I met one of my professors, Justus Buchler, in the book store, He offered me a job teaching in the great general education course, Contemporary Civilization. I phoned my wife, Shirley Rovetch, who had stayed in Detroit, to tell her that I had a job at Columbia. She told me that she was pregnant. Any job was precarious until one had tenure, but I jammed my foot in the door and received tenure in 1961. We took our two daughters, Elizabeth and Jane, to Paris. France was at war with its colony, Algeria. Sometimes the Seine carried the bodies of Algerians, killed by the OAS (The Secret Army Organization) who also blew up buildings around St Germain, and began to use torture in Algiers. It was no place for children, so we drove south to the Cote d?Azur, where we found a marvelous villa on the Escalier de la Gendarmerie. I wrote my first book, Analytical Philosophy of History there Once finished with that, we moved to Rome, where we found an attico on the Via Fogliano. I spent time in the German Library, reading the bound volumes of Nietzsche's correspondence. which led to my second book, Nietzsche as Philosopher. Both books were published in 1965. I loved writing books. At the meeting of the American Philosophical Association, someone asked if I was really publishing two books. He said he supposed they were anthologies, and I answered that they were real books. I felt that the era of articles was coming to an end. But In 1964, I wrote an essay, "The Art World". It raised but hardly answered the question of the difference between art works and real things, if they look indiscernible. The question arose with Andy Warhol's show at the Stable Gallery, which consisted of copies of grocery boxes, and most particularly the Brillo Boxes, which captured my imagination. That essay changed the direction of aesthetics, but I was not to write further on the subject until 1978, the year Shirley died. The mid-sixties was a very productive time, roughly my forthieth year, which the ancients considered the prime of life. I decided to carry forward a somewhat Hegelian agenda: to write a five volume work on analytical philosophy. The unifying concept was that of representation. Analytical Philosophy of History introduced what I termed "narrative sentences". They accounted for the difference between stages of culture - between the Age of Enlightenment and Modernism - though there was nophysiological difference between persons in the Eighteenth and Twentieth centuries. But I also developed a philosophy of action and a philosophy of knowledge. The fourth volume would be on art and the final volume on mind. So when I entered the Stable Gallery, my head was full of advanced philosophy, by contrast with any art historian in the world. By time I was ready for my book on art, I was tired of what was happening in analytical philosophy. I called my book The Transfiguration of the Commonplace, a title I encountered in a novel by Muriel Spark. Basically it advanced a definition of art as an embodied meaning. It became a base for a whole new way of thinking, and has been translated into seventeen languages. The Transfiguration brought another piece of luck. Betsy Pochoda, who had returned to the Nation magazine, after a stint at Vanity Fair. The Nation is the oldest magazine of opinion in the United States, and from the beginning published art criticism. Frederick Olmstead, the visionary designer of Central Park, was one of its first art critics. Clement Greenberg wrote for it in the Forties. But the critic, Lawrence Alloway, had gotten sick, and no one replaced him. When Betsy returned, she was bent on Lawrence, and asked around for suggestions. Ben Sonnenberg, the editor of Grand Street, suggested me. Betsy phoned one day, and invited me to write about art for the magazine. I had never thought of writing criticism, but of course I said "Yes!" I reviewed a wonderful show at the Whitney Museum: "Blamp! New York Art 1957-1964" and Betsy murmured "What a thrill!" when she read it. It was great to be paid for writing, and for prompt publication. I was the art critic for the next 25 years. Most critics in New York were extremely conservative. John Canaday and Hilton Kramer at the New York Times were savage. Time Magazine hissed at Jackson Pollock. My interest was in the new, as in the movements of the Sixties: Fluxus, Pop, Minimalism, and Conceptual Art, after which movements more or less vanished, and the interest turned to single individuals who were thought to be promising. My interest was in explaining the new work, which brought an art-world readership to the magazine. I loved being a critic, and feel that the essays I published, combined with the Transfiguration of the Commonplace, is what I shall be remembered for when I am gone. If one lives long enough and has a bit of luck, everything works out. A distant colleague in the American Society of Aesthetics, Ewa Boltuc, a Polish aesthetician, is a print collector as well as a philosopher. She spotted one of my prints for sale on the Internet, and wrote me about it. I invited her to stop by when she next came to New York. Ewa was very taken with the work, and, as a woman of action, organized an exhibition at the museum at her university in Springfield Illinois. That is not far from the University of Illinois, whose director, Randy Auxier, went to see that show, and decided that his museum must have it. All that took place in 2010. 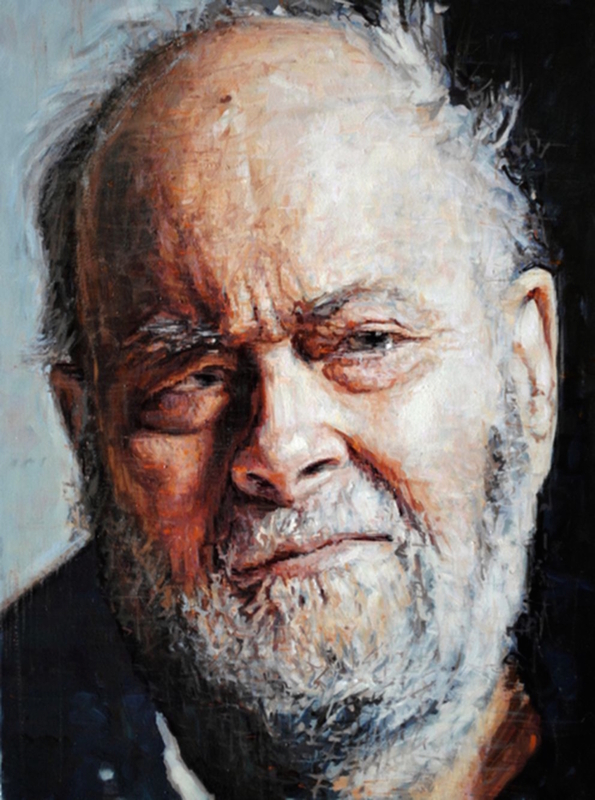 Randy felt that some of my work should be printed in the forthcoming book, The Philosophy of Arthur C. Danto. I at first resisted, arguing that the art had nothing to do with philosophy. But in the end, I came around. In 1962, I had dismantled my studio, and devoted myself to philosophy and later to criticism. But the director of the collection at Wayne State asked me to make a gift of my woodblocks, which had been gathering dust for half a century. I gladly donated them. I certainly have neither the strength nor the drive to do art any longer. But it is part of what I am, along with the rest. For some while, I have been in correspondence with Luca Del Baldo, a remarkable artist. In fact I believe him to be the greatest portraitist in the world. He did an astonishing portrait of me, and all who saw it were astonished.He has now undertaken to do portraits of philosophers of art, and publish these portraits in a book, to accompany an exhibition. I have seen several of the portraits by now - of David Carrier, Hans Belting, Richard Shusterman, and Lydia Goehr. All of these have captured their expressions beyond the possibility of photography. I am thrilled to have been witness to this outpouring of great painting, and I would like to do what I can to give his work the recognition it deserves. Whoever sees these heads, luminous with truth, will acknowledge Del Baldo's exception gifts.